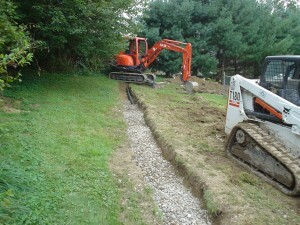 Description: Worked with Putnam County BOH engineer to replace a failed septic system. Came up with a design to import ROB gravel fill pad and install new septic system in a fill pad. Description: Upgraded underground utilities, removed battery and tire storage and replaced, new curbs, water mains, fire hydrants, light pole bases, sidewalks, grease trap and other buried utilities, prepared for new blacktop, storm drains, etc. Description: Cleared the lot, blasted for the driveway and foundation, installed 1000’ driveway with bridge, excavated for new house, new site so new well and septic, septic required fill pad. Description: Curtain drain, basins, and some stone wall work. Description: Replacement of failing foundation. 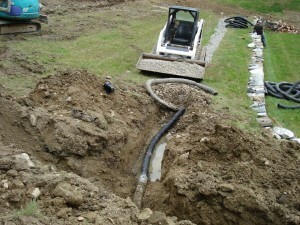 Drainage and site work. 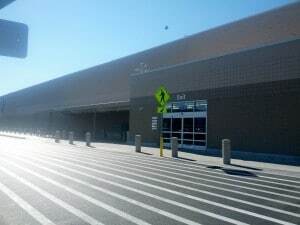 Replacement of 44 decks. 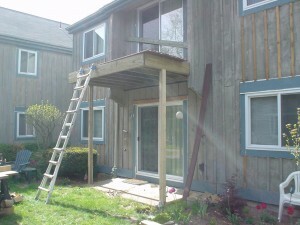 Replacement of cedar board and batten siding.